Air traffic control services were born virtually at the same time as commercial aviation, in the first decade of the XXth Century. When aerodromes were first put in to operation, it became necessary that someone informed the pilots about the condition of the runway, the wind direction and the existence of other aircraft or vehicles in the area, using flags, flashing lights or radio communications. It’s the outset of what we know today as AFIS (Aerodrome Flight Information Service). The quick growth of air traffic and the adverse meteorological conditions in some aerodromes made necessary that ground operators didn’t just inform the pilots, but also give them instructions when they departed or landed, in order to avoid possible collisions. And there was when the history of air traffic control began. 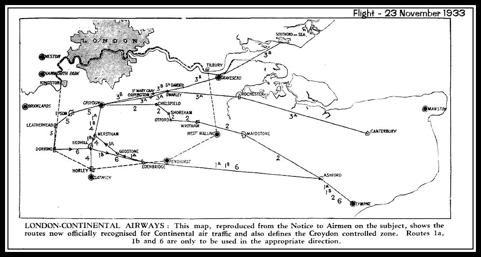 The first aerodrome to provide an actual air traffic control service was Croydon, south of London. In 1922, after a minor collision between an arriving and a departing aircraft, the aerodrome published a NOTAM in which it was stated that all the pilots had to obtain a sequence number for departure, as well as authorisation from the tower for taking off. This authorisation was given waving a red flag from the observation tower. Croydon was also pioneer in establishing an aeronautical radionavigation system, ground-air communications, the use of the Q code, an also a control zone in which it was required that the pilots had authorisation from the controller before entering it. They also developed the first standard procedures to depart, more oriented to appease the neighbours that complained about the noise than for safety reasons. From the control tower, the controller marked the situation of the aircraft on a map with little flags according to the radio signals that the pilots sent, therefore being able to warn them in case he calculated that they were going to fly too close to each other. At the beginning of the decade of 1920 it became clear that commercial aviation was going to be a total success, and that the government should establish a set of rules as soon as possible, in order to regulate the activity. This question was particularly important in Europe, where the big number of frontiers and languages were going to handicap the harmonisation of these rules. To achieve this, and under the umbrella of the Treaty of Versailles, the International Commission for Air Navigation (ICAN) was created in 1919, and it developed the first air traffic regulatory framework, initially signed by 19 states. On the 7th of April 1922, the first mid-air collision took place in France, due to fog, and 7 people died. This compelled the authorities to define the first air routes in the English Channel, and to make compulsory the use of on-board radio equipment and the interchange of meteorological information between the aerodromes. 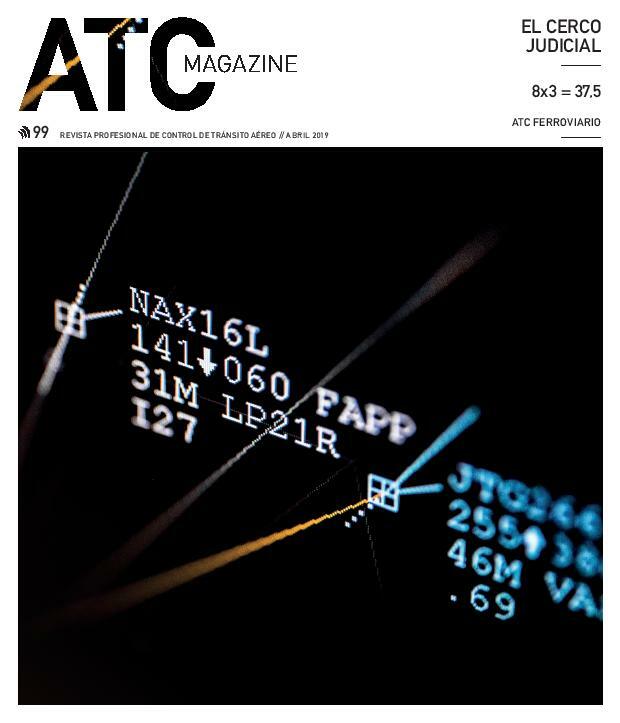 In the United States, after some mid-air collisions of commercial aircraft, a consortium of airliners began to monitor the operation of their own flights. In 1935, in Newark (New Jersey), several carriers created the first air control centre, in order to supervise together their air routes. In 1936, two more centres are opened in Cleveland and Chicago. The Department of Commerce then assumed the control of the operations and, shortly after, opened eight more units in order to cover the United States airspace. At the time they used blackboards to register the positions that the pilots reported, and maps where they placed aircraft in order to avoid mid-air collisions. Taking into account the speed of the aircraft and the flight time, they were able to foresee the future position of the planes and warn the pilots in case a conflict was detected. Shortly after, pilots were instructed to always follow ATC instructions. This method to order and separate the traffic, based on estimated positions and times reported by the pilots, is what we call “procedural control”. 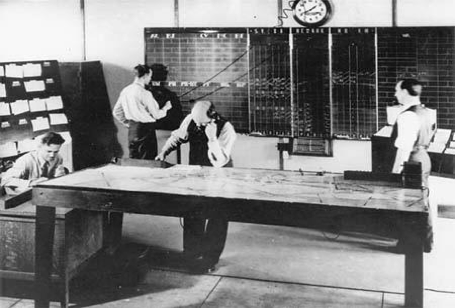 Blackboards and maps would later be substituted by the flight strips, but this kind of control is still used in a similar way in oceanic areas where there is no radar coverage, or in low workload aerodromes. 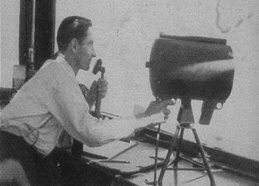 The next step for air traffic control would arrive in 1950, when air control centres were provided with long-distance direct communications between the pilot and the controller. Now there was no need to use *flight handlers in order to transmit the messages. The arrival of radar in the mid 50’s shook the air traffic control system up. The precision of this tool, the modern air navigation systems and the improvement in the ground-air communications, make it possible that nowadays airplanes flying at over 1000km/h need to be separated by only 5kms, which allows the system to safely assume and integrate the constantly increasing number of air operations worldwide. Air traffic control in Spain was developed under the Ministry of Air Defence ward until, in 1977, its competencies were passed on to the Ministry of Transport and Communications. 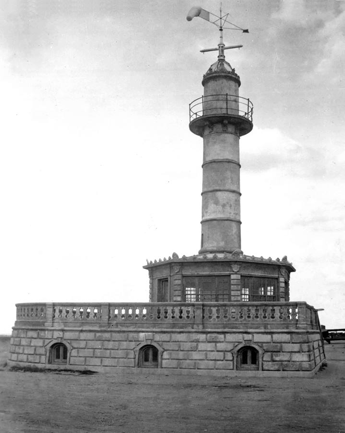 In 1920, following the example of the maritime lighthouses of the time, a signal tower was allocated in Cuatro Vientos aerodrome (1911, Madrid), becoming the first of its kind in Spain. During the decades of the 20’s and the 30’s military aviation increases dramatically, while civil aviation is still very occasional. In the 30’s a network of beacons was created to help night operations, and it remained use until the ‘50s. In the 40’s the “Flight Protection Service” was created nation-wide in order to watch over the safety of the flights. A set of rules for the provision of the service in the airports is created, including basic norms to circulate within the airport facilities and a sign code to be used between the controllers and the pilots. Also in those years, 60 controller positions are called for. In the 50’s, the airspace was divided in 6 regions of flight information (Madrid, Barcelona, Bilbao, Seville, Mallorca and Canarias) and the first official regulation was published (Reglamento de la Circulación Aérea). 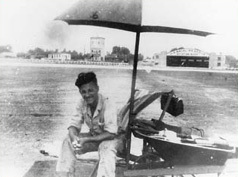 In 1952 Seville became the first air control centre in Spain. In 1954 Madrid would follow. The FAA had a key role helping the Spanish authorities to train the new air traffic controllers, training that included courses in the United States, and in 1955 the air traffic control school in Salamanca opened its doors. In the 60’s, 286 civil servants would make up the special unit dealing with air traffic control (Cuerpo Especial de Controladores de la Circulación Aérea), dependent on the Ministry of Air Defence, and with the allocated technical mission of dealing with the operations related to the order and safety of air traffic. In 1977, air traffic controllers were transferred to the Ministry of Transport, Tourism and Communications. At the beginning, controlled airspace was very limited to certain areas and it went up to just 14.500 feet. Nowadays, over 2.000 controllers in Spain carry out three main tasks: aerodrome control (both at and near the airport), en-route control until up to 46.000 feet, and approach control, where flights are orderly put in sequence before landing and right after departing an aerodrome, using headings, speed and altitude instructions so that the aircraft land and take off with the adequate separation between them. Air traffic control was state owned until 2010, when the PSOE (Socialist Party) privatized part of it, assigning the provision of the service of a dozen control towers to private companies (FerroNats and Saerco). The rest of the units still belong to the public sector. Just like in the rest of the countries, the improvements in the air navigation aids, communications, flow control and radar, have made it possible to cope so far with the increasingly growing traffic. 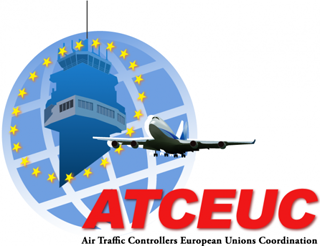 We must not forget, however, that unfortunately these improvements don’t always come with the corresponding necessary human resources provision, so without the huge effort of the air traffic control professionals, many of the objectives would never have been achieved.